Excavations have started at the ancient city of Cyzicus in the Erdek district in Balıkesir province. With one of the most important ancient constructions in terms of size, structure and cultural and art works, Cyzicus is located at the point where the Bandırma-Erdek highway passes the foothills of the Kapıdağ Peninsula. The ancient city gained importance in the 3rd century B.C. as it was on trade routes, had good relations with Pergamum and became a center of science and culture. Cyzicus was friendly with the Roman people after they took over Pergamum, but it also dominated them. The Temple of Hadrian, the most important building revealed by the excavations conducted by academics, is one of the first three Roman period temples dating back to the second century A.D. The temple was very important for the Roman world as it synthesized Greek and Hellenistic ideas and Roman architecture. 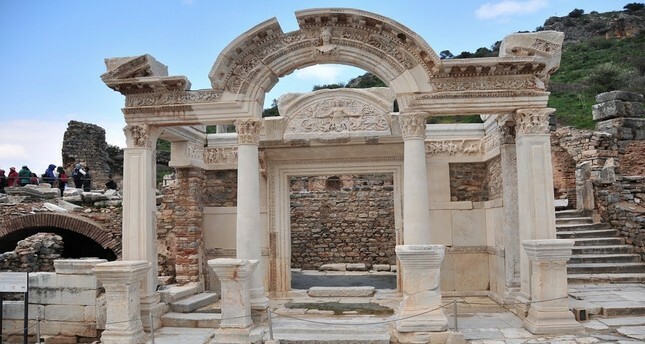 Balıkesir Metropolitan Municipality Secretary-General Mehmet Gürbüz said: "The excavations have been continuing in the ancient city of Cyzicus. In the temple, findings that will contribute to Roman and Anatolian architecture and art and one of the biggest Corinthian headpieces in the world have been revealed. Human and natural conditions negatively affected the temple. The Temple of Hadrian is one of the most important constructions of the ancient period in a sociocultural and art context. The second important building in the ancient city is Cyzicus Amphitheater, one of three examples in Turkey and possibly the most important. At 155 x 180 meters, it can compete with Rome's Coliseum. Work has started to register the ancient city of Cyzicus, which houses the amphitheater, the eighth wonder of the world in its period, on the Tentative List of the United Nations Educational, Scientific and Cultural Organization World Heritage (UNESCO)."